As rainforest icons, parrots' popularity with tourists means they are often painted by indigenous artists. As pointed out in the Birds section (see macaws), macaws are not the largest parrots, and they are closely related to smaller species. Interestingly, most macaw paintings show them in groups or pairs, which is how they occur naturally. 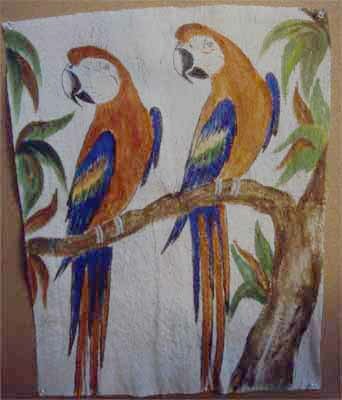 These paintings are on barkcloth, as are the toucan paintings shown in this section (see toucan paintings). 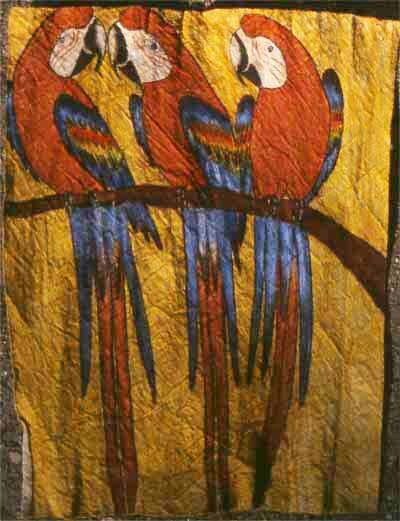 Unlike the toucan paintings, the macaws depicted in this work are readily identified as scarlet macaws. (For a photo of this species, see scarlet macaw.) This is quite a realistic depiction of these birds. This trio of Scarlet Macaws is sitting on a branch, apparently squawking away. In this painting, the artist has provided a yellow background to offset the blue on the tails. The marks left by the beating the material with the back of a machete during the processing of the barkcloth are clearly visible.